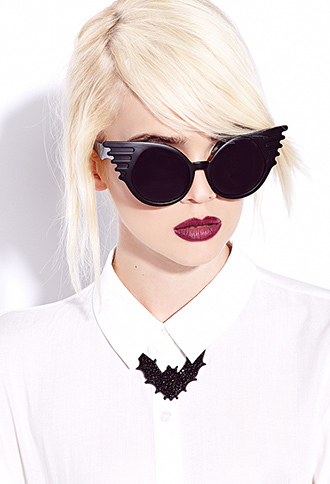 [Fashion] Holy Bats and Cats at Forever 21 Batman! – i swear to goth. [Fashion] Holy Bats and Cats at Forever 21 Batman! I will admit, Forever 21 is an essential for trend fashion and before you crucify me, let me explain why. There are so many fair-weather trends that it’s ridiculous to spend top dollar on them. Neon colors of 2010 fall? Yeah, no way I’m buying a cashmere neon cardigan when I can get one made of acrylic for a fifth of the cost, when we all know I will only where it three times. That being said, Forever 21’s Bat and Cats line pays homage to the best superhero of all time (according to my very educated opinion. I actually prefer Batwoman of the latest DC embodiment, [but not after issue 26 because DC has shamed me,] but she would not exist without Batman!) I can’t get over how inexpensive this stuff is, which is awful because now I feel compelled to by it all. A Batman pencil skirt for less than $15? Great! Now I can buy the Batman PJ onesie as well! Every time I go through a snooty “I only want to by designer pieces because they are classic and last longer” phase, Forever 21 catches me with their oh-so-nonchalant fall novelty runs (ie: Fall 2012 Hello Kitty Line). PLEASE GOD SOMEONE SEND HELP!